Qinhuangdao is a seaside holiday resort, 270 km to Beijing in the east and 210 km from Tianjin. 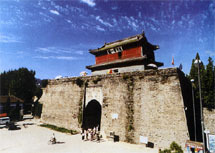 Its main scenic spots include the Old Dragon's Head where the Great Wall empties into the sea. Shanhaiguan Pass-No.l pass in the east of the Great Wall, Meng Jiangnu Temple built up according to a folk tale, the cliff-side Great Wall at Jiaoshan, the Great Wall over a mountain stream at Jiumenkou, the Great Wall Museum, Beidaihe-the seaside summer resort, Nandaihe, the International Sand Surfing Ground by the Golden Coast in Changli, the Wild Animal Zoo, Marine World, Wanbo Cultural City, etc. Beidaihe, with a beautiful environment, is the place where the leaders of the Chinese government work in summer. It holds the Great Wall Cultural Festival, Sightseeing-overthe-See Meeting, Seaside Bird Observation Festival, and Ascending-a-Height Festival on the Ninth Day of the Ninth Lunar Month in summer every year.